The smallest of creatures can cast the biggest of shadows when it finally comes time to say goodbye. 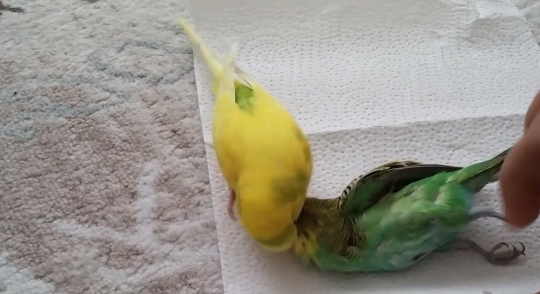 A saddening video clip has been making the rounds on social media in recent days showing a little bird's heartbreaking reaction to her lover's death. As the animals' owner prepares to lay the deceased pet to rest, his companion lingers close by, nudging at his body as if cajole him back to life — unable, it seems, to accept that he is truly gone. Lovebirds mate for life: Monogamy is essential to the social stability of flocks and underlies much of their social behavior. Lovebirds pine for each other: If a mate dies or gets separated from the flock, its companion exhibits erratic behavior that some have likened to depression. Birds kept as pets often don't like being alone and will exhibit similar behavior in captivity. Responses to "Heartbroken Lovebird Can't Accept That Her Mate Is Really Gone "